Goodbye, February! March looks to be coming in like a lion, but it feels like turning a corner, nevertheless. As many of you Trailheads know, March means Charter Day. On the second Sunday in March (the 14th this year), we celebrate King Charles II’s 1681 grant to William Penn of the land that became Pennsylvania. Some of that land eventually became Delaware and New Jersey, but that’s a reality show for another day. 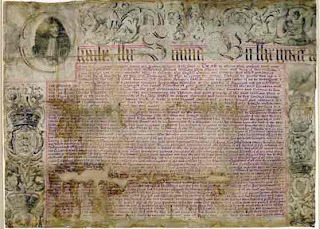 The original charter is in safe keeping at the Pennsylvania State Archives, with a replica on display at the State Museum. For Charter Day, however, the original gets to come out into the (appropriately subdued) light at the Museum. This year, in support of PHMC’s 2010 theme of African American history, the Museum will also display the 1780 Act for the Gradual Abolition of Slavery (through June 20, 2010). Most of the sites on the Pennsylvania Trails of History are open to the public free of charge on Charter Day, with some offering extra programs (check out Trailheads on March 12 for more info on Charter Day activities). As always, we recommend that you check ahead to see if the site you want to visit will be open when you plan to be there. 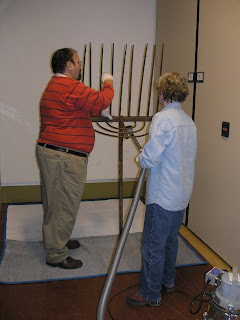 Taking care of Pennsylvania’s historic artifacts and buildings can be an extremely rewarding job. The curators, site administrators, and maintenance staff who work at sites on the Trails of History bring a wealth of expertise, experience, and dedication to the task of managing and protecting the material heritage that ties us to past and future generations. 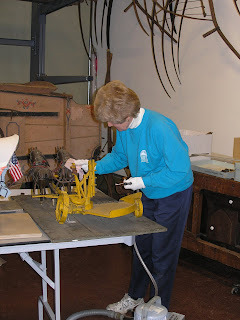 They are frequently assisted by other staff, such as museum educators, and volunteers who are knowledgeable about the care of museum collections. Last month, providing a peek at winter activities on the Trails, I mentioned a collections cleaning blitz at Landis Valley Village and Farm Museum, planned for the last week in January. The Bitzer building, which was the focus of the effort, provides storage for some of Landis Valley’s extensive collection of farming equipment and exhibits many of these items for visitors. 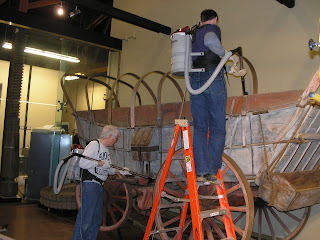 This tremendously successful effort pulled together staff and volunteers from all over the site, under the direction of the museum’s curatorial staff, to accomplish a wagon load of cleaning chores. Some of the Bitzer building exhibits were refreshed and reorganized in the bargain. And a wonderful lunch was served each day to the hungry workers (thank you, Cindy). Planned collections cleaning is definitely a curator’s preference and our sites frequently use winter downtime for that reason. Staff are generally not as busy with visitors, so an all-out effort can be easier to pull together. But sometimes, you don’t get to plan for it. A week before the Landis Valley blitz, an unplanned collections care effort swung into action at a moment’s notice. A sprinkler malfunction in the kitchen of the Saal (meetinghouse) at Ephrata Cloister brought down a mess of plaster, mud, and water. Ephrata Cloister staff, supported by a contingent from Landis Valley (which is nearby), moved quickly and decisively to assess and deal with the problem. The first order of business was triage for the objects—identifying damage (and potential damage) and moving artifacts out of harm’s way. Documenting the event was also extremely important (the photos included here are just a few of many that were taken to make a record of what happened). Once the initial condition assessments were made, the grunge work began. The kitchen’s brick floor had to be washed, and then it had to be dried to avoid the possibility of mold growth. Objects were carefully cleaned to remove mud and debris that, if left to dry and harden, could do irreparable damage. Ephrata staff are monitoring the objects for signs of water damage and/or rust. In the long term, some objects will require further care and treatment by conservation professionals, but the quick actions of PHMC staff and volunteers ensured that these items will continue to help us tell the important story of religious freedom that is embodied at Ephrata. We prefer our lives not to be so dramatic. But preserving our shared heritage is what the people who work on the Trails of History do every day. The snow caught up with me last week, so this post is staying until Friday, Feb. 19. If you would like to make a comment, click on the highlighted number next to the word "Comments" and follow the directions. Thanks to those of you who have commented so far. Okay, so it’s February now, and winter’s kind of grim, and (frankly) I’m out of ideas for this week. Well, not completely. My idea is that I’d like to know more about who’s out there reading Trailheads (besides my mother). At the risk of sending questions out into the blogosphere and receiving no responses at all (which will require weeks of choco-therapy), here goes. Since its inception in August, Trailheads has included posts about programs at sites along the Pennsylvania Trails of History, some behind-the-scenes stories and sneak peeks, info on how sites are employing social media, and what are probably best characterized as miscellaneous posts (like this one). While reader comments are always welcome (we’ve received and posted a few), this time I’m inviting (begging?) you to provide some feedback on the past months of Trailheads. What is of interest to you? What would you like to see more of? What would you like to see less of (please don’t say chocolate references)? 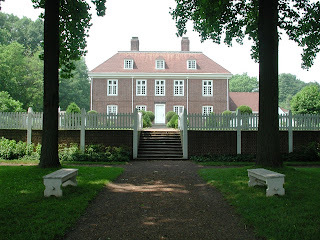 Comments about your favorite sites and museums on the Trails of History are also invited. This is your chance to play a direct role in Trailheads. How can you pass it up?